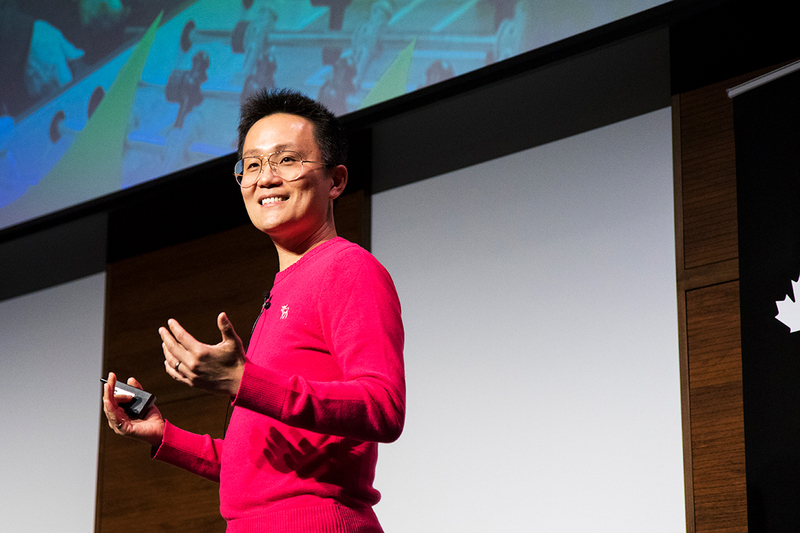 Allen Lau, the co-founder and CEO of story-sharing platform Wattpad, has advice for budding Toronto entrepreneurs hoping to build a billion-dollar business: think globally and take full advantage of the city’s diversity when choosing your team. “You have to look for global growth – and to have that global growth, you need [people with] a global perspective,” Lau recently told attendees at a Startup Canada event held at Toronto’s MaRS Discovery District. It’s a credo the University of Toronto alumnus credited for taking Wattpad, first launched in 2006 with co-founder Ivan Yuen, from a poky e-reader app on the Motorola Razr flip phone to a fast-growing, story-sharing platform with more than 65 million users. Earlier this year, Wattpad raised US$51 million in a financing round led by Chinese Internet giant Tencent Holdings. The deal valued Wattpad at about US$400 million. To illustrate his point about the value of a global outlook for early-stage startups, Lau reached back to Wattpad's earliest days when he and Yuen were struggling to source content and build an audience. Their solution was to import 17,000 books in the public domain – classics by authors like Jane Austen or Charles Dickens. But they also took the seemingly unusual step, for a North American startup at least, of simultaneously importing titles in French, German and several other languages. It also meant Wattpad’s user base, albeit tiny, was technically global in scope – a feature that would later boost the company’s growth following the introduction of the iPhone and the mobile Internet. Case in point: One of the first breakout authors on the platform wrote in both English and Tagalog. “That hack we did early on started to really work because, without that support, the content would not have been discovered,” Lau said. In the years that followed, Wattpad continued to expand support for other languages and convinced Canadian literary icon Margaret Atwood to share stories and poems on the platform. The move allowed Wattpad to ride on the coattails of Atwood’s international reputation, generating coverage in foreign newspapers like the Guardian and Washington Post. The startup’s first big breakthrough came in 2014 when 25-year-old Anna Todd amassed a huge following on Wattpad for her One Direction-inspired fanfiction series After, which drew more than 1.5 billion readers. It was later published and became a bestseller in the U.S. and overseas. In 2015, Lau and the Wattpad team again turned their attention overseas for their first experiment in transforming Wattpad’s popular content, complete with data about the users who read and shared it, into a successful, 200-episode TV series for an Indonesian television broadcaster. Fast-forward to today and Wattpad now boasts partnerships with broadcasters and streaming companies in North America, Asia and Europe. Netflix, for example, has made an original teen romantic comedy that's based on The Kissing Booth, which was first published on Wattpad in 2011 by 15-year-old U.K. author Beth Reekles. Why are studios so interested? In effect, Wattpad serves as a hyper-granular focus group where users' feedback, often chapter by chapter, offers insights into which characters and plots are likely to resonate with audiences, although not necessarily with critics. The Kissing Booth, for example, is one of the most popular streamed movies in the U.S. even though it has been almost uniformly panned by reviewers, as evidenced by its 13 per cent rating on the Rotten Tomatoes website. Yet, despite its growing ties to Hollywood and Silicon Valley, Wattpad has resisted the urge to relocate south of the border. Lau said Toronto's diversity – more than half of Toronto residents identify as visible minorities – has given Wattpad a distinct advantage when it comes to building a company with a truly international outlook. “Your team has to be equipped to think globally and understand all those cultural nuances,” he said, adding roughly half of Wattpad’s employees are visible minorities, about half are bilingual and half are women.